Airbrush makeup has been around for a long time. It was only available to celebrities and professional makeup artists before, but over the last few years companies have made it available to consumers like us. Of course I had to pick the light pink color. The great thing is, unlike the Temptu you can choose your compressor color, which I think is important when are you paying so much for a piece of makeup tool. This compressor is a one speed compressor, which means it will only do the basic foundation and maybe brows. 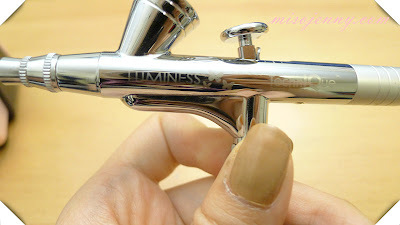 Nonetheless, it is a great starting airbrush machine. When you press the on/off button there is a blue light underneath that will come on when the machine is on. 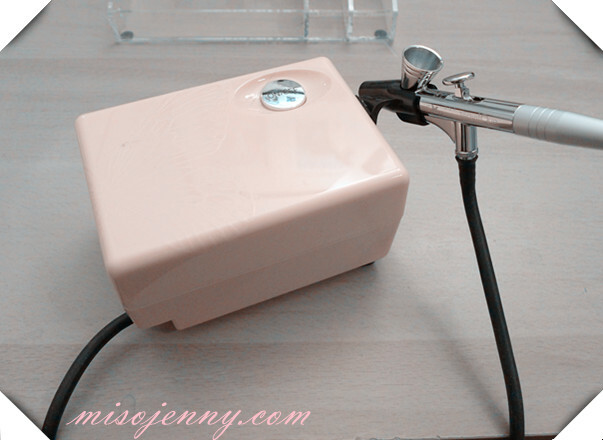 The acrylic stand is super awesome for organizing your airbrush makeup and compressor. If you don't want to use it for your airbrush makeup, that's fine too. 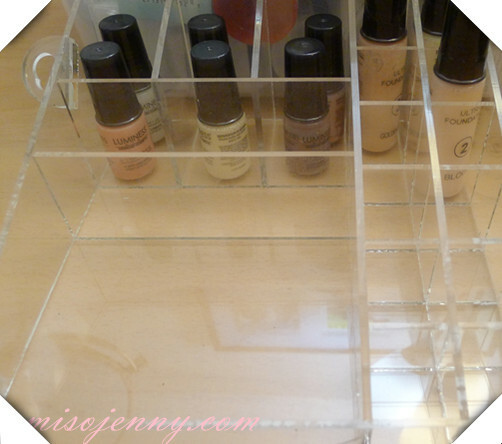 Use it as a vanity organizer! The application is super easy. I don't think anyone can mess up especially given the brochure and DVD that comes with the package. Jenny's Tip: When airbrushing make sure you hold the stylus at least 6 inches away from your face. Also, make sure you pull on the trigger at a continuous rate, and do not use a stop and go method. Sure this compressor is only one speed and does not have external battery so you have to have an outlet in order for it to work, but remember, it is a consumer product and not made to really work "on the go". I think the only problem I really have is figuring out what shade I am. Fortunately, I guessed the right shade. You can also take a look on the website to determine which foundation to choose. Airbrush makeup is such a fun concept, and I have been really enjoying learning how to perfect different techniques. Not only will this reduce your application time, it will also reduce the bacterial infections that might cause pimples. Since there are no brushes to clean it is perfect for "lazy" people like me! I hope this inspired you to at least give airbrush makeup a try. If you do, please let me know how it works out for you! Please leave me a comment below! I love reading all your comments! FTC: This product was sent to me for review purposes. I was not compensated nor am I affiliated with the company is any way. I will only write and say my honest opinions.